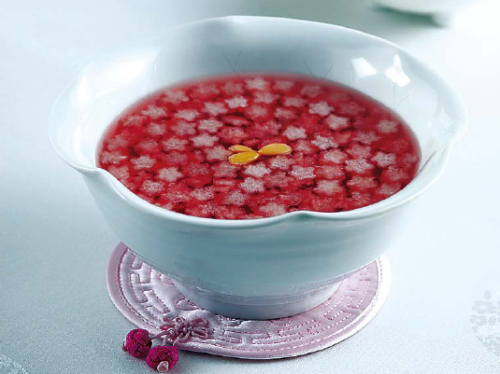 Omija-hwachae is a Korean berry punch made with omija berries and honey or sugar, and garnished with pear. Omija-hwachae is a cold drink that is typically enjoyed in the summer. It has a beautiful color and is high in organic acids which are good for relieving fatigue and quenching thirst. 1. Wash the omija and drain the water. 2. Add water to the omija and let it sit for 12 hours. 3. Remove tops of the pine nuts and clean them. 4. When they are fully soaked, strain the omija and retain the liquid. 5. Add sugar and honey to the omija water. 6. Peel the pear and cut into slices 0.2 cm-thick, carve into pear flower shape. 7. Put the omija water into a punch bowl, topping with the pear and pine nuts.